We’d love your help. 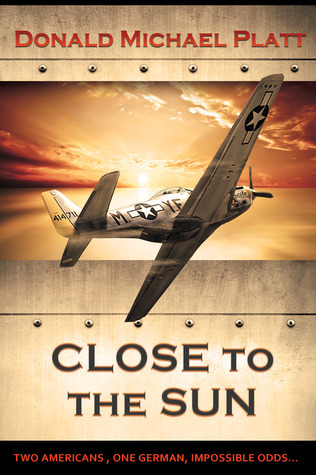 Let us know what’s wrong with this preview of Close to the Sun by Donald Michael Platt. The young men encounter friends, Close to the Sun follows the lives of fighter pilots during the Second World War. As a boy, Hank Milroy from Wyoming idealized the gallant exploits of WWI fighter aces. Karl, Fürst von Pfalz-Teuffelreich, aspires to surpass his father’s 49 Luftsiegen. Seth Braham falls in love with flying during an air show at San Francisco’s Chrissy Field. To ask other readers questions about Close to the Sun, please sign up. I was offered to be able to pre-review Donald Michael Platt’s Close to the Sun and I jumped at the chance, with my love of the history of anything to do with flight or fighter planes I had high hopes. This book certainly soared for me! It's an amazing story told from the perspective of average male fighter pilots in the onset and during WWII, juxtaposing between various men from many sides of the war. He makes one remember that the lives, desires, and pursuits of these enlisted men had almost no I was offered to be able to pre-review Donald Michael Platt’s Close to the Sun and I jumped at the chance, with my love of the history of anything to do with flight or fighter planes I had high hopes. This book certainly soared for me! It's an amazing story told from the perspective of average male fighter pilots in the onset and during WWII, juxtaposing between various men from many sides of the war. He makes one remember that the lives, desires, and pursuits of these enlisted men had almost nothing to do with the plan of their governments and as well that they really weren’t all that different from each other in many regards. The details in this novel were spectacular, creating imagery and depth in the scenes and characters, as well as the dialogue being so nostalgic and well-written it felt right out of a 1950’s film. The romantic nuances of his storytelling felt incredibly authentic with the tug and pull of the men being called to serve and the women whom they loved who had their own high hopes, dreams, or work. I loved how he portrayed these women the most—strongly and fiercely independent. Throughout his book, Platt also shows the differences in the lives of people during the war based on what country they were living in, for instance, in moving between them with new chapters, he highlighted what they were, or weren’t due to rations, eating, smoking, drinking, etc. I’ve read several other books by Platt, and this is the best one I’ve read yet! I couldn’t stop reading. Though there are lots of technical details sprinkled into the book, it never weighed down the story. As the battles of war raged on, he did a marvelous job showcasing his male characters love of flight above all things, as when they soared in the clouds like eagles, all other cares ceased to exist. He’s written a lasting legacy to many pilots on all fronts that served during this time. As an Air Force brat myself, with fond memories of the flight line as a child, and an affinity for flight, I truly feel he captured the essence of the obsession of flying and made you feel the euphoria and drive of those pursuing this dream. I felt a bit like I was watching another version of "Top Gun" at first and then I enjoyed how he utilized the backdrop of WWII, in which he shows that for some men it was mostly all about the pursuit of flying and making flying records, though they are always patriotic as well and learn the dark side of flying in war. I highly recommend this book to anyone who has a penchant for WWII historical and/or aviation novels, yet would like to read a fresh and original story. I love historical fiction novels and I especially love historical fiction novels that take place in America or involve Americans in a historical capacity. When I saw, “Two Americans, One German, Impossible Odds…” I was intrigued. I know this would be another war novel but I love the American perspective. From the first few words I was hooked on the novel and knew it was one with which I would fall deeply in love. I was right. Hank, Karl and Seth are characters that start out so idyllic and optimistic. They think they understand war and they dream of the heroism that comes along with aerial combat. Hank idolizes the fighter pilots of WWI, Karl aspires to surpass his father’s legacy and Seth has known he has a passion for flying since that day at the air show. They all knew they wanted to fly and they all dreamed of flying at war but they didn’t understand the grim reality of battle until they were thrust into the middle of it all. It is a fast-paced book and the only negative about it is that it’s over so soon. These young adventure-seeking boys find their lives turned upside down by callous political decisions and disastrous mistakes. The horrific atrocities they witness at the end of WWII put a dark spin on all their dreams of glory. Close to the Sun is an amazing tale of adventure, heroism, war and the drive within us all that keeps us going when things look bleak. I cannot recommend this book highly enough. If you are a historical fiction fan please pick up a copy, I assure you that you’ll love it! ARC received from Historical Fiction Virtual Tour for an honest review. Anytime I read about service man and woman I feel humbled. Their commitment, courage and strength never fail to astound me. Donald Platt’s “Close to the Sun” was no exception. There were many details about the life of WWI fighter pilots. I loved learning about Hank Milroy, Karl, Fürst von Pfalz-Teuffelreich and Seth Braham. I thought that the author was really able to capture their uniqueness ARC received from Historical Fiction Virtual Tour for an honest review. Anytime I read about service man and woman I feel humbled. Their commitment, courage and strength never fail to astound me. Donald Platt’s “Close to the Sun” was no exception. There were many details about the life of WWI fighter pilots. I loved learning about Hank Milroy, Karl, Fürst von Pfalz-Teuffelreich and Seth Braham. I thought that the author was really able to capture their uniqueness and their combined passion for flying as pilots during such an intense time in U.S. history. I have to confess that my favorite was Catherine “Winty” McCabe. I loved that the author included her in this story. Women were definitely not considered when it came to become pilots but Winty really pushed the limits and played by her own rules. Princess Maria-Xenia, Elfriede “Elfie” Wohlmann and Mimi Kay all added a female voice and experience during this time period. The author really developed each of these characters and their individual stories became part of one big story. Platt’s writing was engaging and very technical. Although I knew next to nothing about fighter pilots after reading Close to the Sun, I felt more knowledgeable. I highly recommend this book for anyone that enjoys learning about WWI, fighter pilots, or is just looking for a cast of great characters. The harshness of war is never pleasant and I commend Platt for giving a voice to such a trying time in U.S. history. When I was asked to read this book I jumped at the chance. It's about pilots! What's the big deal about pilots you ask? My husband has his private pilots license and son #3 is working on his. The early part of our marriage involved me learning about Messerschmitt's, Mosquito's, Mustang's and other fighters. So reading this book was a wonderful relearning experience. Lately I've been reading so many books about WW II, this book was a nice change given that it was from on high, the pilots point of When I was asked to read this book I jumped at the chance. It's about pilots! What's the big deal about pilots you ask? My husband has his private pilots license and son #3 is working on his. The early part of our marriage involved me learning about Messerschmitt's, Mosquito's, Mustang's and other fighters. So reading this book was a wonderful relearning experience. Lately I've been reading so many books about WW II, this book was a nice change given that it was from on high, the pilots point of view. Having never gotten a glimpse from that angle it was very interesting to watch Karl, Hank and Seth train and work towards their goals with such passion and commitment. Taking place during the course of the war there is much going on, not just the air to air combat, but political situations and more. Of course this book wouldn't be complete without women and a little romance. Winty (tomboy, pilot also), Miriam (singer), Elfi (nurse) and Mariya-Xenia round this book pleasingly with their authentic story lines. There is no doubt that the author has done a remarkable job with research, it shows. The story line was real and matched the time period perfectly. Definitely an author I will read more of. One of the things that impressed me most about this excellent novel was the way the author achieved a balance among the three converging story lines. It would have been easy to let one take over and eclipse the others, but each of the three held its own from beginning to end, which naturally made the ending even more powerful as the three stories wove together, resulting in a whole that was more than the sum of its parts. Close to the Sun has interesting and highly individual characters, both ma One of the things that impressed me most about this excellent novel was the way the author achieved a balance among the three converging story lines. It would have been easy to let one take over and eclipse the others, but each of the three held its own from beginning to end, which naturally made the ending even more powerful as the three stories wove together, resulting in a whole that was more than the sum of its parts. Close to the Sun has interesting and highly individual characters, both male and female. It is a real page-turner, paced to make it hard to put down. Loved the 1940's flavor of the dialogue, too. As other reviewers have said, this book would make a wonderful movie. Mr. Donald Michael Platt has created one of those rare books that when you finish it, you immediately wish there was a sequel. His writing style takes you deep into the lives of those who fought in the air and those they left behind. What I loved most about this book is that it showed the battle from both perspectives. The ebb and flow of war, the blurring of right and wrong. Simply said... this is a great book! I don't normally read "man" books, but I was drawn to this because of the aviation theme. It follows three different men as they pursue their dreams of flying pursuit planes and enter WWII. One man is a German. I had a hard time enjoying his stories. His personality was that of a jerk. One is a Jewish American. Something didn't grab me about his bits. Even his romance was uninteresting to me. But then we have Hank and I really, really like Hank. All his parts were interesting to me: the girl Wint I don't normally read "man" books, but I was drawn to this because of the aviation theme. It follows three different men as they pursue their dreams of flying pursuit planes and enter WWII. One man is a German. I had a hard time enjoying his stories. His personality was that of a jerk. One is a Jewish American. Something didn't grab me about his bits. Even his romance was uninteresting to me. But then we have Hank and I really, really like Hank. All his parts were interesting to me: the girl Winty, his experience in cadet school, the men he knows (like the Texan), motorcycle races... I learned a lot about how early Army Air Force training was like--from the hazing to the lack of flight time to the pursuit vs bombers issue. I had no idea that bombers were "uncool". Don't seem one bit uncool to me! The book can drag if you're not interested in one or two of the main characters, but if you like the characters and have an interest in aviation history, this is for you. Matter of fact, I got my husband a copy of this one. Born and raised inside San Francisco, I graduated from Lowell High School and received my B.A. in History from the University of California at Berkeley. After two years in the Army, I went to graduate school at San Jose State where one of my short stories was published in the college’s literary magazine, THE REED, and I won a bathch of awards in the annual SENATOR PHELAN LITERARY CONTEST. After te Born and raised inside San Francisco, I graduated from Lowell High School and received my B.A. in History from the University of California at Berkeley. After two years in the Army, I went to graduate school at San Jose State where one of my short stories was published in the college’s literary magazine, THE REED, and I won a bathch of awards in the annual SENATOR PHELAN LITERARY CONTEST. After teaching English and Creative writing at Los Gatos Union High School, I moved to southern California and began my professional writing career. I sold to the TV series, MR. NOVAK, ghosted YOUR HAIR AND YOUR DIET for health food guru, Dan Dale Alexander, and wrote for and with diverse producers, among them as Harry Joe Brown, Sig Schlager, Albert J. Cohen, and Al Ruddy as well as Paul Stader Sr., dean of Hollywood stuntman and stunt/2nd unit director. Also, options were taken on my unpublished WWII fighter ace novel and several treatments. While living in Hollywood, I taught creative writing and Advanced placement European History at Fairfax High School where I also was Social Studies Department Chairman. After living in Florianópolis, Brazil, setting of A GATHERING OF VULTURES,* DarkHart Press, 2007,we moved to Florida where I wrote as a with: VITAMIN ENRICHED, pub.1999, for Carl DeSantis, founder of Rexall Sundown Vitamins; and THE COUPLE’S DISEASE, Finding a Cure for Your "Lost" Love Life, pub. 2002, for Lawrence S. Hakim, MD, FACS, Head of Sexual Dysfunction Unit at the Cleveland Clinic.